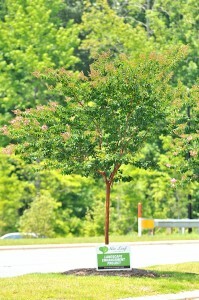 Be a significant part caring for the environment in the Burlington and entire Alamance County area by purchasing a tree for $50 each to recognize loved ones, honor a friend, celebrate birthdays, anniversaries, or any special occasion. Choose an option to HONOR or IN MEMORY, and then proceed to fill out the form with the credit card purchasing information or check. New Leaf Society will send notification to the person you identify with a personalized message once payment has been received. The trees that you purchase for $50 each will be utilized for new plantings determined by current projects or to replace damaged or diseased plant material in existing landscapes. The value of your gift will increase exponentially as the tree grows and will continue to benefit future generations. – Control $31,500 worth of soil erosion.